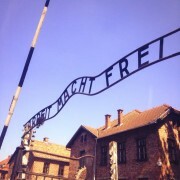 From around the world people have come to visit both Auschwitz and Birkenau. Traveling through both camps is an eye opening experience. When people think about the Holocaust most associate it with the Jewish victims, but the Jews were not the only victims. You grow up learning about what happened to start World War II, as well as the events that happened to the victims of the Holocaust. However, actually being on the site of the mass murder of so many people in the 1940s, is an experience hard to explain. While walking around the both Auschwitz and Birkenau you can only imagine what it looked like and the experiences that the people had while living in these camps. The camps are still standing, but they no longer look like what they did back then. The overall experience is an emotional one, whether you’re feeling anger, frustration, sadness, confusion, or something entirely else. Walking where history and memories have been made, knowing that so many people died because of a hatred, is something that creates a variety of emotions depending on which part of the camp you’re visiting. Walking through Auschwitz, our tour guide informed us that the first prisoners brought to the camp in June 1940 were political prisoners, 728 people who were teachers and doctors, not necessarily Jewish. The original plan for Auschwitz was not to create an extermination camp; that idea evolved with the implementation of the Final Solution. 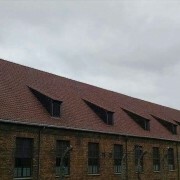 In Auschwitz prisoners were kept in many of the 28 blocks, which were the places the prisoners inside the camp stayed. Each block held somewhere between 400-800 people. The walk around the camp is solemn, even though you have headphones on for listening to the guide, people move around largely in silence. You can hear the crunch of rocks as people walk around you. Entering Block 4 was one of the hardest parts of the tour for me. we were led into a room with the remnants of the people’s hair, large heaps equaling a total of 7 tons of human hair, that had been found in bags after the camps were liberated. Walking through the darkly lit room, and seeing the piles of hair was something that simply took my breath away. People had their heads shaved as soon as they entered the concentration camps; for other victims, heads were shaved after they were killed in the gas chamber. Although the Holocaust has been over for decades, the hair is still there, showing that even though the number of people killed was never counted precisely, there is evidence that they existed in the camps. Next, we walked to Block 5, which contains the suitcases that the people left as they got off of the trains, before going through a selection process, which meant either being chosen for labor or to be sent to the gas chambers. The next room contains shoes of different sizes, colors, and styles that the people who had entered the camp had to give up. This was evidence that people came to the camps at different times of year. The thing that struck me the most about the shoes was seeing those for children. Seeing the kid’s shoes and their clothing was hard, because they were so little they did not know what was going on. However, this was not the most emotional part of walking through Auschwitz. The newly constructed Block 27, proved the most emotional part of the experience visiting Auschwitz and Birkenau. When you first walk into this new exhibit, you see a prayer on the wall and a song being sung. This was the part of the tour in which you didn’t need to wear your headphones to hear the tour guide’s words. In the next room we saw videos from people’s lives before the war, before their lives were changed and they were sent to concentration or death camps. The videos sent shivers down my spine. The joy and happiness on the people’s faces is something that shouldn’t have ended. I was filled with anger, frustration, and sadness when I saw how they lived ordinary lives before the Holocaust. 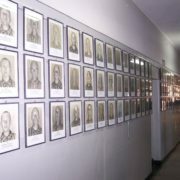 If the videos weren’t enough, as you walked upstairs you saw the pictures that children had drawn copied onto the walls. The pictures start as any other child would, with pictures of their family, sunshine, and normal houses. However, these images change. They begin to show people with guns, tanks, and death. These are things children should not be drawing, it was actually disturbing. Their innocence was ripped away from them. Most children had forgotten their name, because they went by the number tattooed on their forearm. To finish off the tour of Auschwitz, we walked into one of the gas chambers just outside of the camp. I have seen pictures and movies of what the gas chambers had looked like, but walking through one where thousands of people perished was an eerie and uncomfortable experience. As you walked through you saw how big they actually are and where the holes in the roof were to drop the Zyklon B. As you exited the gas chamber you walked right into the crematorium, in which the Sonderkommando had to pull the bodies out and look for gold teeth, and throw them into the oven to be cremated. 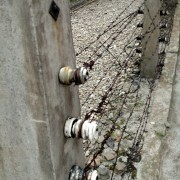 This was the end of our tour at Auschwitz. 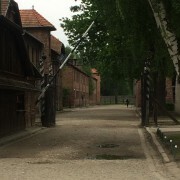 As we arrived at Birkenau the atmosphere was different. The camp was huge and open compared to Auschwitz. 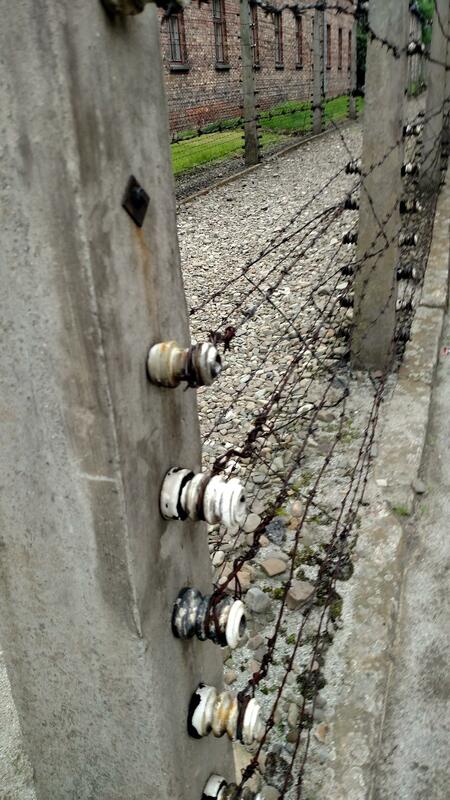 Inside Birkenau, there are camps inside of camps. We saw visitors from around the world, including people wearing a flag with the Star of David. On the selection ramp we saw an authentic box car on the railroad tracks. When we walked up to it, I was surprised at how small it was. The tour guide told us that this car had been preserved by a man who had witnessed his father getting beat to death for not letting go of something in his arms after getting off of the train. The father was holding onto his Torah. After, we walked along the railroad tracks to the site of the burned down Crematory Number 3. 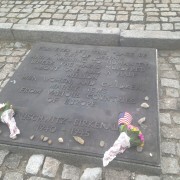 This is the part that struck me the most throughout our visit in Birkenau. The Crematory was burned down, but you’re able to look inside and understand what it must have looked like. Living inside the remnants of the crematory was a family of foxes. This is the most powerful image: that there is a chance for new life and beginnings even in the place of horrific experiences. 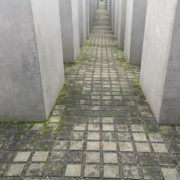 The events that happened at the hands of the Nazis is something that will be in history books, but being able to see the site is something that has more of a powerful impact on a person.